Felipe Massa's victory in Bahrain requires little analysis. The Brazilian took the lead at the start from poleman Robert Kubica and he held on to the advantage throughout the race, allowing others to lead only when there were pit stops. It was a triumph of efficiency and helped Massa to redeem himself, after throwing away a good result in Malaysia. "These have not been very easy weeks," he admitted, having made mistakes in both opening races and been beaten up by the Italian media, "but that's life. It wasn't the first time and it won't be the last. I knew we were quick, so I didn't want to make any mistakes, just to bring the car home and control the pace keeping in mind what happened in the last races. I love this circuit, we are always very strong here." On this occasion the World Champion Kimi Raikkonen had nothing to use to respond to Massa and in the end he settled for second place, thinking about the World Championship. Kimi had been struggling to stay with Massa all weekend. "The whole weekend has been pretty difficult," he said. "We could not get the car quite right, but if it's a bad weekend and you still finish second, I don't mind. The championship is the main thing." 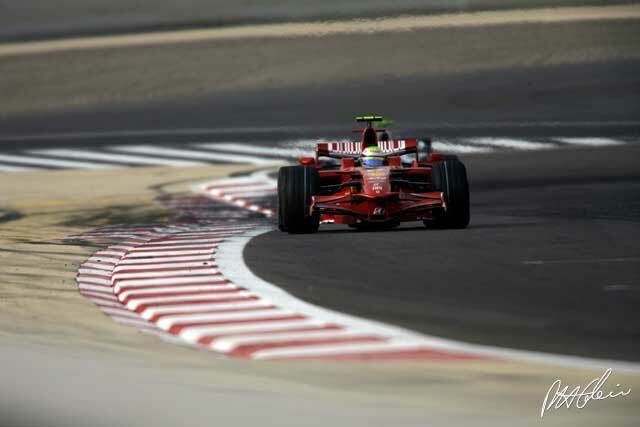 Raikkonen made the move of the race early on as he tried to follow Massa in overtaking Kubica. Massa had done it at the start when Robert was slow away. "I had some problems with wheelspin on the formation lap, and again at the start," he said. "Then the car felt like a tyre was going down. Without that I think I could have kept Kimi behind me." As it was Raikkonen went alongside the BMW on the outside at Turn One on the third lap. He held on and managed to squeeze ahead. Once that was done there was not much to write home about. Kubica fought back in the closing stages of the race as Nick Heidfeld closed in behind him. This left Massa with nothing to worry about and he paced himself. "The car was very, very good and I didn't need to push completely because I saw the gap increasing," he said. So we had a Ferrari 1-2 and a BMW 3-4. What had happened to Lewis Hamilton? His was the story of the race, for things just went wrong. One after another. The McLaren was very slow off the line. Hamilton's team-mate Heikki Kovalainen, fifth on the grid right behind him, was only just able to avoid his car. He got it all sorted out but he was ninth by the end of the first lap. "The anti-stall kicked in," he explained. "I hadn't hit the switch early enough and therefore we were not in the launch map and went straight into anti-stall, and when everyone else was in their launch mode, I wasn't." On the second lap Hamilton's day got worse when he ran into the back of Fernando Alonso's Renault, knocking off his front wing as he did so. "I was behind him and it was very, very close and it looked like I could overtake. I went to the right and he went to the right. I couldn't help but go up the back of him. That's racing. I'm always the first to blame myself, and to be honest that's the right way to go." That meant a pit stop and by the time everything was sorted out, with new tyres and fuel to go to halfway he was down in 18th place, with a big gap to the nearest car ahead of him. With a heavy car and eventually traffic it was not easy and the damage that had been done to the car's aerodynamics meant that his tyres suffered. By the end of the race he was nowhere, with a fastest lap that was so bad that it was two and a half seconds a lap slower than Heikki Kovalainen's fastest lap of the day. "It was a disaster," Lewis said. "A very poor performance. I sort of let the team down today. I'm as disappointed as you could be, I guess. As a professional, when you start off badly you need to pick things up and still deliver, and I did none of that for the team." That was hard on himself, but scoring no points on a day when Ferrari got the maximum was a blow. Nick Heidfeld was also having a bad weekend, but he managed to parlay that into fourth place. "The car's balance on this track was just not how I wanted it to be. I hope I won't have such troubles again. Finishing the race just one position behind my team-mate, who started from pole while I was sixth, is a good result." On the way to fourth he was able to get ahead of both Jarno Trulli and Heikki Kovalainen. Heikki did a good job after making a bit of a mess at the start. Initially he was ahead of Raikkonen but he made a mistake and then flat-spotted a tyre and suffered a vibration as a result. "It vibrated so much that I was worried something would fall off the car," he said. New tyres improved his chances and he charged hard towards the end but fifth was as good as he was going to get. Fifth and fastest lap. Trulli was next up and was delighted with a trouble-free run, while behind him was Mark Webber, who was happy to pick up two points. Behind him was Nico Rosberg who took a point but had expected more from his Williams. He did rather better (again) than his team-mate Kazuki Nakajima, who ended up 14th. Kazuki needs to do better. Williams knew that this year would not always be easy with a young driver and one wonders if there was not a little angst about the choices that were made. Timo Glock found his Toyota difficult on its second set of tyres but was still able to hold off Fernando Alonso. The Spaniard said he got everything out of his Renault, and that was only good enough for 10th. This was not a good sign. At the end of the race he came under attack from Rubens Barrichello's Honda, which had spent much of the afternoon trying to overtake Giancarlo Fisichella's Force India. Sebastian Vettel was out after two collisions on the the first lap. "I had a really good start this time after not so good ones in the previous two races. I was off like a rocket and I was able to pass two or three cars. Then going into first corner, when I was in the inside, I was blocked. We were really tight and I collided with a ForceIndia. My front wing was a bit damaged but this was not the main problem, which came in Turn Four when someone arriving from the inside hit me on the rear right, causing the big damage that forced me to retire." Button also got hit in Turn Five. That gave him a puncture too, so the pits were busy, especially as Coulthard had also sustained some damage. The two Brits would bump into one another later when on lap 18 Button tried to pass the Red Bull, got into a bit of a will-he-won't-he moment and smacked into the Red Bull. Coulthard was quite slow after the first corner incidents, but went into the pits again and changed the front wing and set off. Also gone on the first lap was Vettel who departed in a cloud of smoke. Bourdais said that he had extracted the maximum from his Toro Rosso. Probably the most entertaining battle of a long afternoon was that between Super Aguri team-mates Anthony Davidson and Takuma Sato. Nelson Piquet in the second Renault blew his chances with a spin on the second lap and he later went out with gearbox trouble. It was not a great race and it meant that F1 could go on concentrating on the matters of the moment in the paddock. Down at McLaren they wondered about BMW but felt that once again the German-Swiss cars had looked better because the leaders were comfortable. They are closer than they have ever been, but are they winners? For Hamilton it was time to reflect on a pretty disappointing time.